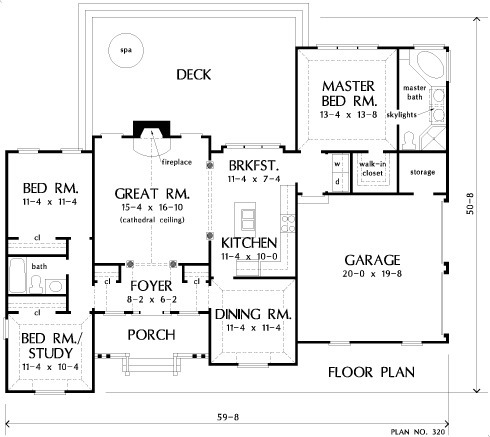 We kept all the country charm when we down-sized one of our most popular plans for home builders on a budget. Columns punctuate the open, one-level floor plan and connect the foyer, with clerestory dormers, and kitchen/breakfast room to the large great room with cathedral ceiling and fireplace. A front porch and large rear deck extend living space to the outdoors. Tray ceilings lift the master bedroom, dining room, and bedroom/study out of the ordinary. The private master suite features a garden tub, double vanity, walk-in closet, separate shower, and operable skylights. 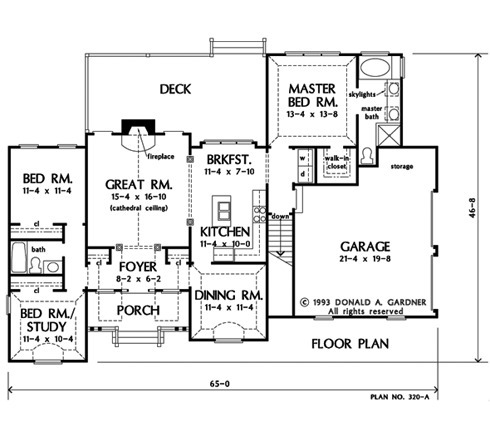 1st Floor: 1498 Sq. Ft.
House Dimensions: 59' 8" x 46' 8"
Great Room: 15' 4" x 16' 10"
Master Bedroom: 13' 4" x 13' 8"
Foyer : 8' 2" x 6' 2" x 10' 0"
Dining Room (Tray): 11' 4" x 11' 4" x 9' 6"
Great Room (Cathedral): 15' 4" x 16' 10" x 15' 10"
Kitchen : 11' 4" x 10' 0" x 8' 0"
Utility Room : 3' 0" x 5' 4" x 0' 0"
Garage Storage : 6' 4" x 5' 4" x 0' 0"
Master Bedroom (Tray): 13' 4" x 13' 8" x 9' 6"
Bedroom / Study (Tray): 11' 4" x 10' 4" x 9' 6"
Bedroom #2 : 11' 4" x 11' 4" x 8' 0"
Deck / Patio : 27' 4" x 18' 0" x 0' 0"